External partnerships and strategic collaborations between companies and the academia are expected to drive R&D and the revenue growth of the veterinary vaccine market. For example, veterinary vaccine manufacturer Zoetis revealed that through two collaborative research projects funded by the 6th and 7th EU Framework Programs, Suvaxyn CSF Marker, a potent new live marker in veterinary vaccines for Classic Swine Fever (CSF), was developed, validated and finally approved by EMA in February 2015. Manufacturers of veterinary vaccines stress upon the importance of regular constructive communication for successful external R&D collaborations for the development of veterinary vaccines. The demand for veterinary vaccines is increasing as antimicrobial usage among farm as well as companion animals has reducing over the past five years. Fears of avian influenza and zoonosis, coupled with government initiatives to restrict Antimicrobial Drug Resistance (AMR) in animals and human beings, are fuelling the demand for veterinary vaccines. These veterinary vaccines reduce reliance on anthelmintic and antimicrobial drugs for treating infections. Manufacturers of veterinary vaccines are adopting advanced technology to develop better veterinary vaccines, such as live attenuated and recombinant, to curb zoonotic diseases. Veterinary vaccine manufacturers are largely dependent upon governments of individual countries and respective veterinary vaccine departments for large-volume sales. Veterinary vaccine manufacturers resort to tender-based and direct sales routes for distribution to large farms in developed countries. Veterinary vaccines for livestock are purchased in bulk, while companion animal veterinary vaccines are purchased on a retail basis, primarily for welfare purposes. A consolidation in the downstream, i.e. between distributors, puts pressure on the already crunched margins in the veterinary vaccines market. This restraint is primarily noted among animal farms located in developed countries dealing with cattle and hog population. The development of cold chain and storage systems is another factor hampering the distribution of veterinary vaccines in less-developed markets. Veterinary vaccine manufacturers are likely to benefit from expanding their presence in the MEA region. The large cattle population in the MEA and the growing demand for poultry & milk products in the Middle East is driving the demand for feed additives, veterinary vaccines and drugs. Steady government support and increased international funding for developing cold chains for the transportation of veterinary vaccines is likely to boost the revenue. Increase in the number of initiatives undertaken by various governments in Africa to promote aquaculture is projected to fuel the demand for adequate veterinary vaccines. Globally, there is an increase in the demand for lean meat in the food basket as against red meat. This is fuelling the demand for veterinary vaccines in the poultry segment. In this regard, Erick Lelouche, President of Boehringer Ingelheim Animal Health France noted that “As poultry consumption continues to rise around the world, there is an increasing demand for avian veterinary vaccines. This means that our LPA production site in Saint-Priest was going to reach a saturation point by 2020. We had to do some forward planning and find additional production capacity.” This indicates additional expansion for the manufacturing of avian veterinary vaccines by the leading manufacturers of veterinary vaccines around the world. Note: For a detailed analysis of all the key market factors, request a sample. The FMI report titled “Veterinary Vaccines Market” provides detailed information about the growth parameters of the key players of the veterinary vaccines market. It includes a detailed competitive assessment of the veterinary vaccines market. 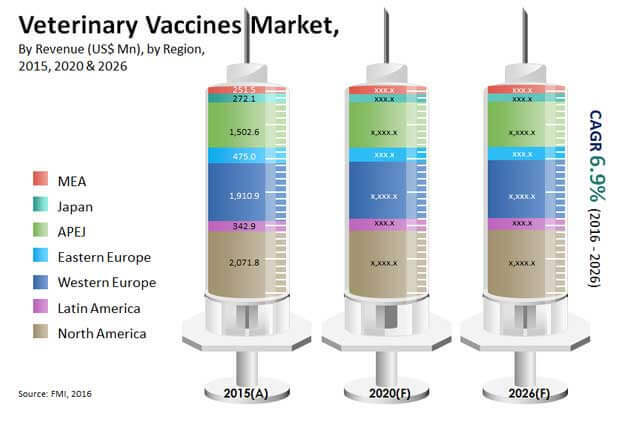 The market study provides comprehensive data on different stakeholders in the veterinary vaccines market, which include Zoetis, Elanco, Merck & Co. Inc., Boehringer Ingelheim GmbH )(BIVI), Bayer Pharma AG, Ceva, Virbac, Diamond Animal Healthcare (Heska) and Indian Immunological Ltd. The veterinary vaccines report provides readers all-encompassing data on the revenue shares of veterinary manufacturers, winning strategies and latest information on mergers and acquisitions in the veterinary vaccines market. Considering the rapidly-growing veterinary vaccines market, expansion in emerging economies is taking centre stage. Some of the latest M&A big ticket deals in the veterinary vaccines market have been elaborated in this report. For instance, Elanco completed the acquisition of Boehringer Ingelheim Vetmedica, Inc.’s (BIVI) U.S. feline, canine and rabies vaccines portfolio in January 2017. Elanco also acquired Lohaman Animal Health, which has a significant presence in the poultry vaccine segment. In addition, technological advancements are fuelling the entry of novel veterinary vaccines. In May 2016, Bayer signed an agreement with BioNTech AG for exclusively developing novel mRNA veterinary vaccines and therapeutics for animal health applications. Veterinary vaccines are a cost-effective prophylactic method to prevent veterinary diseases. Veterinary vaccines enhance the efficiency of food production and reduce or prevent the transmission of zoonotic & foodborne infections to people. The veterinary vaccines market report encompasses attenuated live vaccines, conjugate vaccines, inactivated vaccines, subunit vaccines, toxoid vaccines, DNA vaccines and recombinant vaccines. Attenuated live vaccines and inactive vaccines are the most widely manufactured veterinary vaccines. Attenuated live veterinary vaccines are derived from disease-causing pathogens, such as virus or bacteria, which have been weakened under laboratory conditions. Inactivated veterinary vaccines are made from microorganisms, such as viruses, bacteria and others, which have been killed through physical or chemical processes. The market study on the veterinary vaccines market was recently published by FMI. It provides comprehensive information about the most important veterinary vaccines market dynamics that are expected to prove instrumental during 2016-2026. Companies in the veterinary vaccines market can find the most accurate quantitative and qualitative information about the growth parameters of other veterinary vaccines manufacturers, which can help them develop data-driven business strategies in the near future. The FMI report on the veterinary vaccines market provides salient information about market players. The veterinary vaccines market is segmented by geographical region, product type, disease application, animal type, disease application and distribution channels to analyse the segment-wise growth of the veterinary vaccines market. Based on the geographical region, the veterinary vaccines market is segmented into seven regions: North America, Latin America, Western Europe, Eastern Europe, Japan, Asia Pacific Excluding Japan (APEJ) and the Middle East & Africa (MEA). The veterinary vaccines market is segmented into product types, viz. attenuated live vaccines, conjugate vaccines, inactivated vaccines, subunit vaccines, toxoid vaccines, DNA vaccines and recombinant vaccines. Depending upon the disease type, the veterinary vaccines market is segmented into anaplasmosis, canine parvovirus, foot & mouth disease, Newcastle disease, distemper disease, influenza, Porcine Reproductive & Respiratory Syndrome (PRRS) and others. By animal type, the market is segmented into companion animals, livestock animals and equine. By distribution channel, the veterinary vaccines market is segmented into veterinary clinics, veterinary hospitals, veterinary research institutes and retail pharmacies. Which product types account for the maximum demand in the veterinary vaccines market? Why are the sales of veterinary vaccines the highest in North America? Which regulations in various regions are influencing the strategies of players in the veterinary vaccines market? What are the current technology trends adopted by various players in the veterinary vaccines market? Which strategies are being applied by market players to sustain in competition in the veterinary vaccines market? The process of market research followed at FMI commences with extensive secondary research of the veterinary vaccines market. Analysts obtain industry-validated, historic and current data about the demand for veterinary vaccines across the globe. Comprehensive secondary research is followed by extensive and in-depth primary research, where detailed information about the veterinary vaccines market is obtained in terms of value (US$ million). Based on thorough secondary and primary research about the growth parameters of the veterinary vaccines market, analysts have come up with the most precise forecast about how the veterinary vaccines market will grow during the forecast period. A recent market study published by FMI “Veterinary Vaccines Market: Global Industry Analysis and Opportunity Assessment 2016 – 2026” consists of a comprehensive assessment of the most important market dynamics. On conducting a thorough research on the historic as well as current growth parameters of the veterinary vaccines market, growth prospects of the market are obtained with maximum precision. The report features unique and salient factors impacting the development of the veterinary vaccines market during the forecast period. It can help the manufacturers of veterinary vaccines modify their manufacturing and marketing strategies to envisage maximum growth. The veterinary vaccines market report provides detailed information about the current and future growth prospects of the veterinary vaccines market in the most comprehensive way for stakeholders. The report commences with the executive summary of the veterinary vaccines market report, which includes a summary of key findings and statistics. It also includes the market value (US$ million) estimates for the leading segments of the veterinary vaccines market and differentiating strategies applied by leading market players. This chapter helps readers understand the research methodology followed to obtain various conclusions, important qualitative information and quantitative information about the veterinary vaccines market. Veterinary vaccines have been tracked based on the market share of manufacturers by revenues in the overall market. Furthermore, data on pricing has been analysed separately to arrive at the correct value of the total market. Market value validation has been done through interviews with key stakeholders in the veterinary vaccines market. Detailed taxonomy and the definition of the veterinary vaccines market-related products, applications and end user channels are included in this chapter. This chapter also provides various definitions pertaining to the veterinary vaccines market. This chapter includes the analysis key drivers, challenges, trends and opportunities of veterinary vaccines market. A global overview of veterinary vaccine products, supply chain analysis and regulations has been provided. This is expected to help introduce the readers to important factors complementing the growth of the veterinary vaccines market. This chapter provides details regarding the macro-economic assumptions taken to set the scenario affecting the veterinary vaccines market being adopted in leading countries. This is expected to give a clear understanding on the veterinary vaccines market value derivation. This chapter details the global veterinary vaccines outlook denoted by a comparative assessment by region and by country over the period 2015-2026. It also includes insights about global healthcare indicators. This chapter provides details regarding the assumptions taken to set the scenario that affects the veterinary vaccines market, which is being adopted in the leading countries. This is expected to give a clear understanding of the veterinary vaccines market value derivation. Based on the product type, the veterinary vaccines market is segmented into attenuated live vaccines, conjugate vaccines, inactivated vaccines, subunit vaccines, toxoid vaccines, DNA vaccines and recombinant vaccines. In this chapter, readers can find information about the key trends and developments in the veterinary vaccines market and market attractive analysis based on the product type. The veterinary vaccines market is segmented on the basis of diseases that require veterinary vaccines into anaplasmosis, canine parvovirus, foot & mouth disease, Newcastle disease, distemper disease, influenza, Porcine Reproductive & Respiratory Syndrome (PRRS) and others. This chapter includes detailed information about the demand-supply analysis of treatments that require veterinary vaccine depending upon their disease applications. By species type, the veterinary vaccines market is segmented into companion animals, livestock animals and equine. Details on the global requirement of veterinary vaccines analysis by livestock (aquatic, bovine, porcine, ovine and poultry), companion animals (canine, avian and feline) and equine can be found in this chapter. By distribution channels, the veterinary vaccines market is segmented into veterinary clinics, veterinary hospitals, veterinary research institutes and retail pharmacies. Details on the global analysis by veterinary vaccines distribution channels can be found in this chapter. This chapter explains how the veterinary vaccines market will grow across various geographic regions such as North America, Latin America, Western Europe, Eastern Europe, Japan, Asia-Pacific Excluding Japan (APEJ) and the Middle East & Africa (MEA). This chapter includes a detailed analysis of the growth of the North America veterinary vaccines market along with a country-wise assessment including the U.S. and Canada. Readers can also find regional trends, regulations and market growth based on product type, disease type, animal type and distribution channel of veterinary vaccines. Impact analysis on the dynamics of veterinary vaccines is also provided along with the key presence of leading players in the North America region. Readers can find detailed information about factors such as key regulations and regional trends that are impacting the growth of the Latin America veterinary vaccines market. This chapter also includes the growth prospects of the veterinary vaccines market in the leading LatAm countries such as Argentina, Brazil, Mexico and the rest of the Latin American region based on product type, disease type, animal type and the distribution channel of veterinary vaccines. Impact analysis on the dynamics of veterinary vaccines is also provided with the key presence of leading players in the Latin America region. Important growth prospects of the veterinary vaccines market based on product type, disease type, animal type and distribution channel is provided for countries such as Germany, UK, Italy, Spain, France, BENELUX, NORDIC and in Rest of Western Europe. This chapter also includes key regional trends and factors shaping the growth of the veterinary vaccines market. Impact analysis on the dynamics of the veterinary vaccines market are also provided along with the presence of leading players in the Western Europe region. Readers can find detailed information about factors promoting the revenue growth such as key regulations and regional trends that are impacting the regional veterinary vaccines market. This chapter also includes the growth prospects of the veterinary vaccines market in leading countries such as Australia & New Zealand, India, ASEAN, Greater China and the rest of APEJ. This region is currently witnessing very high adoption of veterinary vaccines and is expected to remain sustainably profitable. This chapter includes the revenue growth and forecast of the Japan veterinary vaccines market, which is segmented into product type, disease type, animal type and distribution channel. It also includes key factors and trends affecting the Japan veterinary vaccines market. This chapter provides information on about how the veterinary vaccines market will grow in the major countries of the MEA region such as GCC Countries, South Africa and the rest of MEA during the period 2016-2026. In this chapter, the report provides detailed information about the growth parameters of the veterinary vaccines market with the help of a detailed assessment of the competitive environment in the veterinary vaccines market. The market study provides comprehensive data about each stakeholder in the veterinary vaccines market, including Zoetis, Elanco, Merial, Merck & Co., Inc. and Bayer Pharma AG, among others. The report provides readers all-encompassing data on each manufacturer’s revenue shares, winning strategies and latest information on mergers and acquisitions in the veterinary vaccines market.